Still no word on what is actually ailing Fr. Gerald — a medical conundrum! But, according to the latest speculation, it may not be cancer. We wait with prayer and bated breath. We prayed for him at every Mass in Rome and in all the sacred places. For my original post about Fr. Gerald, click here. For the latest update from his parish bulletin, written by himself, click here. 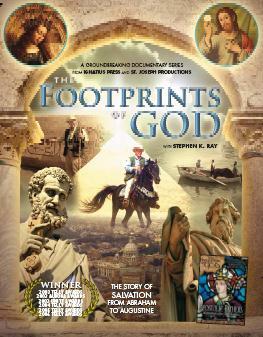 Check out this gorgeous new 4-page Footprints of God brochure that Ignatius Press just printed. With this new brochure we are updated to include the latest DVD Apostolic Fathers and the latest awards we have won.